Two enormous cathedrals are currently being built in Bucharest: one Orthodox, and one secular. The Orthodox cathedral was last week handed 10 million lei (around €2.5 million) in funding by the Romanian state, a move which sparked (understandable) outrage amongst a large section of liberal Romanian society (which believes that the state should not be funding cathedrals at all). 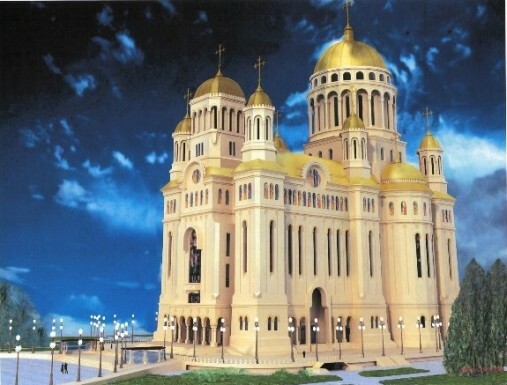 The project will cost in total around 200 million lei, with the Romanian Orthodox Church now expected to find the rest from donations, benefactors or the banks. The current government has stated quite clearly that there can be no more public money for the project. The secular cathedral on the other hand – which is now close to completion – has so far benefited from almost €90 million in state funding (either directly from the government or from the local budget), and it is estimated that it will need another €60 million before completion this summer. Unlike the Orthodox cathedral (which is being built on open space behind Casa Poporului) the secular cathedral required the demolition of a historic monument. And yet – with a couple of honourable exceptions, including the incomparable Sorin Ionita in Evenimentul Zilei (in Romanian) this morning – we have heard nor read barely a word of objection to the public funding of the secular cathedral. Shurley shome mishtake? A cathedral is, after all, a cathedral, regardless of the religion?